Leeds, West Yorkshire, is the biggest city in the north of England (though some of the locals may give the impression that Yorkshire should be a separate country in its own right), and recently has been doing very well for itself (sometimes to the surprise of southerners), with terms like “thriving” and “vibrant” being bandied about. The city centre is compact, devoid of hills, and easy to walk around; redevelopments over the past decade have made it a much more pedestrian-friendly place to navigate, as well as generally sprucing up the city and giving it a look that, at least at first glance, belies its industrial heritage. Most fortunately the combination of the prevailingly wind direction and the shape of the surrounding countryside means that the cities of Manchester and Sheffield syphon off much of the rain heading in this direction, and Leeds is often dry (honestly). Sometimes it's even sunny, too. Many photos of Leeds are on a separate page. Leeds has good rail and coach links from the rest of the UK and shares a small international airport with nearby Bradford. There's a much bigger airport at Manchester, which has frequent trains to Leeds. Being just off the M1 Leeds is also relatively easy to reach by car — though the city centre one-way system isn't something visitors to the area seem particularly fond of encountering. More details on the directions page. Linux 2004 takes place at the University of Leeds, specifically the Medical Teaching Centre, which is on the north-east edge of the city centre. Parking is available on the Saturday and Sunday. The conference accommodation, with plenty of car parking, is Clarence Dock, a short stroll along the canal from the south-west of the city centre. The perceptive will note that this arrangement gives ample opportunity for ambling through the city, though there is also a bus service. At the ground level Leeds centre is packed with shops, bars, and restuarants. Take a few moments to crane your neck upwards and you'll see many fine instances of Victorian, Edwardian, and Georgian architecture. Harvey Nichols is probably the city's most famous store, the luxury clothes retailer's first venture outside London. Shoppers come to visit it from all over, despite the ridiculous prices. For the rest of us there is still fun to be had in wandering round the store while looking as scruffy and unkempt as possible and watching the security guards tail you ever so closely. The rest of the Victoria Quarter is also worth a look, both for the building and the shops therein. A visit to the nearby Thornton's Arcade should be timed carefully so as to experience the delightful mechanical clock marking the hour. Prices are much more reasonable at the The Corn Exchange, which contains a number of small idiosyncratic emporiums under its distinctive domed roof. This is adjacent to Kirkgate market, another spendid building, and full of stalls offering everything from fresh fish to USB optical mice. And of course Leeds also contains the usual bunch of chain stores, which are collectively doing so much for the drive to make all British high streets completely interchangeable. 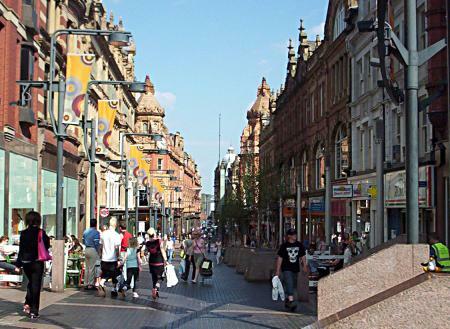 Many of these are to be found on Briggate, or in one of the shopping centres: The Light, The Headrow Centre, Leeds Shopping Plaza, The St John's Centre, and The Merrion Centre. There are several good traditional pubs in Leeds, serving a selection of real ales. These are the best places to spot the natives, who you'll recognize by their strange accents (in which communication can be achieved with very few words, sometimes degenerating into mere gulps) and flat caps. Whitelocks was established in 1715 and can be found, somewhat incongruously, along a small alley just off Briggate. The Scarborough, The Palace, and the Victoria Family & Commercial Hotel (which has live jazz on a Thursday) and The Grove (with live folk music on a Friday) are also real ale pubs. Very different drinking establishments are the numerous trendy bars which now infest the city centre. Typically so full there's no chance of a seat and playing music so loud you can barely order at the bar let alone have a conversation, the preferred drinks are supped directly from bottles and are often brightly coloured. The names (and decors) of these bars change frequently, but the general idea remains about the same. For more details on places to go in Leeds, including nightclubs (not all of which have been the scene of violent incidents involving Leeds football and rugby stars), comedy clubs, gay bars, and live gigs we recommend consulting the Leeds Guide, published fortnightly, available from newsagents in the area, and containing an excellent city centre map. For slightly higher-brow culture there's the art gallery and the Royal Armouries museum. Leeds Town Hall and the Grand Theatre are both places of architectural interest. Reader's of Bill Bryson's Notes from a Small Island will be pleased to learn that the Leeds Royal Mail sorting office he lists among the buildings he “would deeply love to blow up” has recently been demolished. Under no circumstances try to visit Leeds Castle, since that is several hundred miles away, in Kent. Millennium Square, in front of the Civic Hall, is often used to stage events throughout the year, including pop concerts, beer festivals, an ice rink, and a German Christmas market (though admittedly neither of the last two are likely to be found there in mid-August). The city has churches of several denominations if that's your kind of thing. 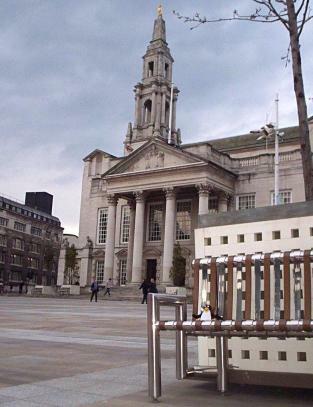 Leeds accommodates many religions, with most of the places of worship situatated outside the centre. If you have time to extend your stay, there are places to visit just a little farther a field. Headingley, a few miles north of Leeds centre (with frequent buses), is famous for its eponymous cricket ground. (Cricket is a game that initially appears to have some superficial similarities with baseball, but is played with a much straighter bat.) The popular rugby league team Leeds Rhinos are also based in Headingley. At the time of writing Leeds does still have an association football (“soccer”) team, though it's perhaps better not to mention that in pollite conversation. There are train services to many villages and market towns, and you can end up somewhere very rural indeed after travelling just a short distance. Ilkley features some spectacular countryside (and some friendly pubs), though if you go for a walk on the moor remember to take a hat else risk having a song being written about you. Saltaire is a historic model community, built by Sir Titus Salt for the workers in his mill (which now features permanent exhibitions of the artist David Hockney). The city of Bradford features the excellent National Museum of Photography, Film, and Television, where it's all too possible to while away entire afternoons browsing their archive. Bradford is also famous for it's many curry houses, which offer very good meals for exceedingly reasonable prices. Further to the north is the walled city of York, with the cobbled streets of the shambles it's a much quainter place, very different from the modern bustle of Leeds. Tourists are well catered for, with regular guided tours in open-top buses; popular sights include the York Dungeon and Jorvik Viking Centre.